To say I loved my Grandfather Goldin would be an understatement. For as long as I can remember, I doted on him and he on me. I was his favourite. In the 4th grade, I "invented" a bird feeder with him in mind that won a contest. I chose my university so I could live close to him. One of the main reasons the children have double-barrelled names is so that Ellis could have Grandpa's name within his. When I knew him, he was a kind man, with a love of music, gardening, birds and sweets. He used to sing me "K-K-K-Katie" and tease me about my childhood obsession with the film Annie. He could play the piano and I can not hear Scott Joplin's The Entertainer without thinking of him. Grandpa loved to eat. Unlike the stereotype of people of his generation, he was adventerous. We would meet for lunch at a variety of resturants - Asian Fusion, Mexican, Steak Houses. He was up for trying things and we would sit and talk for hours, enjoying each other's company over a meal in ways that I only hope my children will share one day with their grandparents. However, his favourite restuarants were the Jewish diners peppered around Chicago. Grandpa Sol was Jewish. He married my Irish Catholic grandmother in the 1930s and had 5 children, all of whom were brought up Catholic. He never spoke much about his faith and other than my last name, there were few things that showed my links to that side of the family. But some things passed on. When I grew up in Iowa, we were some of the first people to know what bagels were. And Halva. And Matzo's, eaten with a shmear of margarine and a dash of salt. But when Grandpa and I met up, it was Matzo Ball soup we would eat. On paper, a big ball of mushy bread hardly sounds appetising, but they became some of my favourite foods. He would tell me stories and I would do my best to make a dent in the dumpling the size of my head. 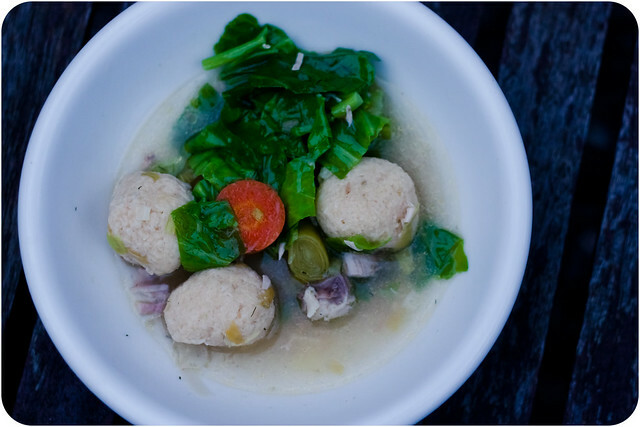 I hadn't thought about Mazto Ball Soup in a long time. I'd never told Ellis the story of his name or every really mentioned my beloved Grandpa Goldin. But when I stumbled across a bag of Matzo meal in the local grocery store, I knew I had to make them. And I thought, that is what food is, at its best. Its not only good and nourishing, but its tradition and memories and connection. And, like everyone who ever has lost a loved one, I wondered what he would think about my life now. Would he be proud? Would he hate my nose ring? What would he think of my house? My work? Would he laugh at Ellis' jokes? Be taken in by the demon with pigtails? Or think Theo is the sweetest baby ever like everyone else does? And importantly, what would he think of my Matzo Ball Soup? Mix all of the ingredients in a bowl and let sit in the refrigerator for about 15minutes. It will be very wet initially, but firm up with resting. Wet your hands and form into smallish balls, roughly 1.5 inches across. Drop into broth or soup. 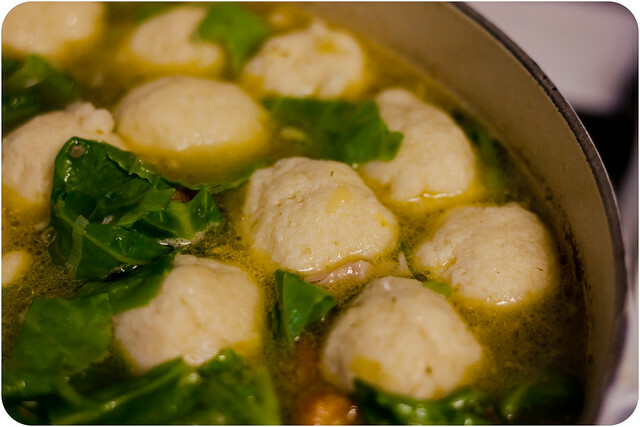 I use them like dumplings in a chicken vegetable soup, but they are very often served with just broth.